Dr. Berthe-Marie Njanpop-Lafourcade is in charge of Laboratory Services at AMP and is the laboratory expert for all AMP field projects, including clinical studies. In this role, she supports the Ministries of health and collaborates with WHO and other partners for surveillance of epidemic-prone diseases, develops lab networks for meningitis and cholera microbiological surveillance, communicates laboratory objectives to biologists working in the field and collaborates with them to set up new technologies (microbiological mobile lab, PCR, RT-PCR, …) and quality insurance for disease control and vaccine impact/effectiveness studies (meningitis, cholera, pneumonia, pertussis, …). Before joining AMP in 2002, Dr. Njanpop-Lafourcade worked at the county veterinary laboratory in Corrèze (Tulle), where she set up a PCR lab for the diagnosis of spongiform encephalopathy in cattle. Prior to that, she worked in the National veterinary laboratory in northern Cameroon, focusing on bacterial zoonotic diseases and leaded the bacterial vaccine production. 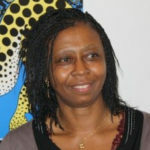 Dr Njanpop chairs the lab working group (LWG) of the African meningitis surveillance consortium (MenAfriNet-joined AMP-CDC project) and is a member of Cholera LWG of WHO Global Task Force on Cholera Control (GTFCC).